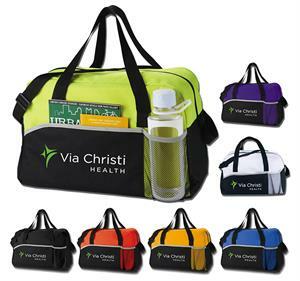 17" Energy Duffel bag is made of 600d polycanvas with non-woven accents. Our Energy Duffel is made of 600d polycanvas with non-woven accents. It has a zippered main compartment, a front pocket with hook and loop closure and a front mesh pocket. Double 22” reinforced carry handles and adjustable shoulder strap make it easy to carry. Colors: Black, Lime Green, Navy Blue, Orange, Purple, Royal Blue, Red or White. 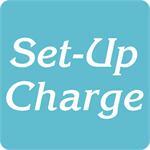 For logos: Add a set-up charge of $50.00 per location on new orders; $25.00 on re-orders. For Full-Color Imprint (Photograffix): Add one $50.00 set-up charge plus 79¢ each per location.